No good yesterday, with a monster blowout (33/1, 14/1) in the fourth. I wouldn't have had those in a million years, so we must wipe our mouths and move on... to Market Rasen's big day of the year, Summer Plate day. 1.45 - Leg 1: We start with a strong favourite, and a very cheap place lay to insure the early bath. It's Only Business has easily the best credentials, though there are some runners capable of major improvement. He's 1.1 to lay, so we have the option of a 10% insurance premium on the bet. 2.20 - Leg 2: The magnificent Man Of Leisure, in which I own two hairs as a racing club member, runs here. He's progressive and has his chance. But so are, and so do, all the rest! The worry with Massannie is that she's stepping out of mares' only company, and that could just find her out. I'm against her, for better or worse. Va'Vite looks to have a better chance the First In The Queue, despite the disparity in jockey bookings (ten pound claimer versus AP McCoy). Va'Vite should be the stouter stayer, as he showed when beating FITQ the last day. Swampfire might just want it softer, and his sire, Anabaa (also sire of Goldikova and Priceless Art, a geegeez horse), doesn't get too many winners over this far. Again, if like me you think Leath Acra Mor has no chance, it's possible to take First In The Queue, Massannie and Swampfire in a reverse forecast, just in case they run 1-2. That's another insurance policy which can be deployed in short fields. 2.55 - Leg 3: The Summer Hurdle is a big field of able timber-toppers, as befits a race worth £35k. We want good ground, big field, classy hurdle form here. I reckon the market has this pretty much spot on, with the trio of Sea Lord, Barizan and Coffee having the best chances. I'd also add last year's winner, Local Hero, to that list, and be fairly happy that the winner is within that quartet. If pushed, I'd side with Sea Lord, whose beating up of Man Of Leisure - himself a duffer up of many others - last time might have been advertised in the previous race. 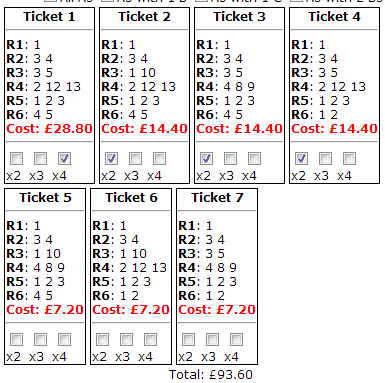 3.30 - Leg 4: The Summer Plate, a £50k race! Paddy The Hare might bid to make all as favourite here, and he'll have to be very good to do that in this company. I have a slight bias here, but I think Finger Onthe Pulse might run a cracker. He's twelve now, but that didn't stop him winning a very truly run race last time when Priceless Art was pulled up (couldn't live with them). He's won a Festival handicap chase and a Galway Plate in his time, and good ground and a big field is ideal for him. Interestingly, perhaps, eleven of the thirteen winners of this race finished 1-2-3 last time, which does narrow things down rather. Peter Bowen has a brilliant record, with four wins, and four more places from 23 runners. He saddles Dineur here and, while I'd generally be worried about his ability to handle the trip and big field, the fact he's Bowen's only representative is of interest. Bocciani deserves his big weight, and has won on this track at a slightly shorter trip, with a suggestion he'll prefer further. Problema Tic won a similar contest at Perth a couple of starts back, but that was slightly less well contested. This might just be on the short side for Galaxy Rock, who is back to a winning mark, but he will be plodding on better than most and is classy. He has McCoy atop too. Pineau De Re isn't exactly well handicapped, but he is in form, and has won under similar conditions. Royale's Charter would be interesting if seeing out this longer trip. The lack of money for him is a negative, but he ticks a lot of boxes for a race like this. Gentleman Anshan likes it here, and while he was no match for Paddy The Hare last time, this stronger gallop could find the Hare out and enable the tortoise to reverse the form. As you can tell, it's far from a simple puzzle, and I'm taking a few swipes at it. 4.05 - Leg 5: Win only here, so care advised. In fact, there's no sense in being heroic despite a very well supported favourite in Chasing Shadows, who will almost certainly try to make all. He'll go on A, with Engai and Super Collider, and I'm against Mighty Snazy, who could bounce. If the 'pot is shaping up, obviously I can back Mighty Snazy to cover expenses. 4.35 - Leg 6: This might also go win only if we're not careful, with five currently declared. Tough Talkin Man and General Miller are the two pace makers, and the former might just go on. I think the form of the latter has been under-rated a bit here, and he could surprise a few. Roger Beantown is favourite and top weight, and comes from well respected connections. He won nicely last time, and was bred for this game. Progressive. And Fearless Leader comes from the brilliant placer of handicappers, David Bridgwater, and has been backed. That leaves My Mate Vinnie, who just might get outpaced over this shorter trip and is about the only one I would be prepared to exclude! I'm taking a bit of a gamble here, by playing the longer priced pair on A. You might want to play the shorter ones on A, and make a combination forecast with the longer odds trio. 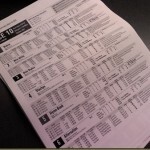 Hi Matt – I did have friends horse M. of M. so softened the blow of my son putting the Placepot on correctly yesterday. The day before he ….. up on your A list horses ! I didn’t have any money on it but McCoy could have easily got 3rd. It’s frustrating to see him ride like that once he’s lost the race. Disappointing for sure, especially for people who didn’t lay the place. Hopefully, some will have backed Man Of Leisure and Sea Lord (as I write, before the fourth race). Gutted we’ve gone down in the fifth leg! Inspired tipping for the first four. So close…..
Well done with M. of L. today Matt – good win and a nice price too !